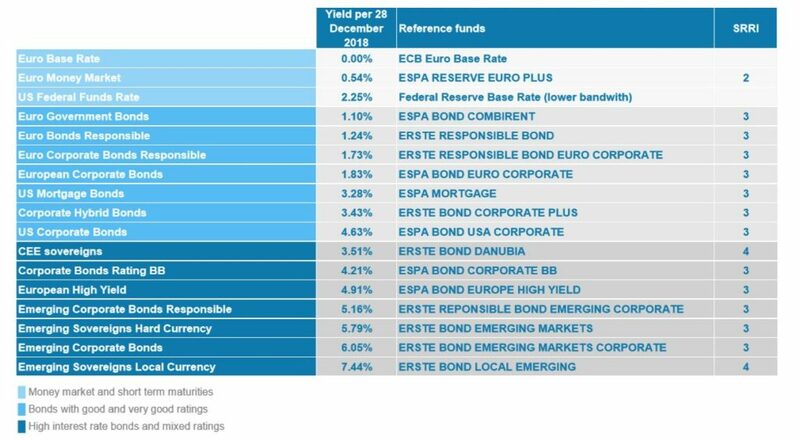 In the past year 2018 performance of all fixed income asset classes, except Euro-government bonds, ended in negative territory. 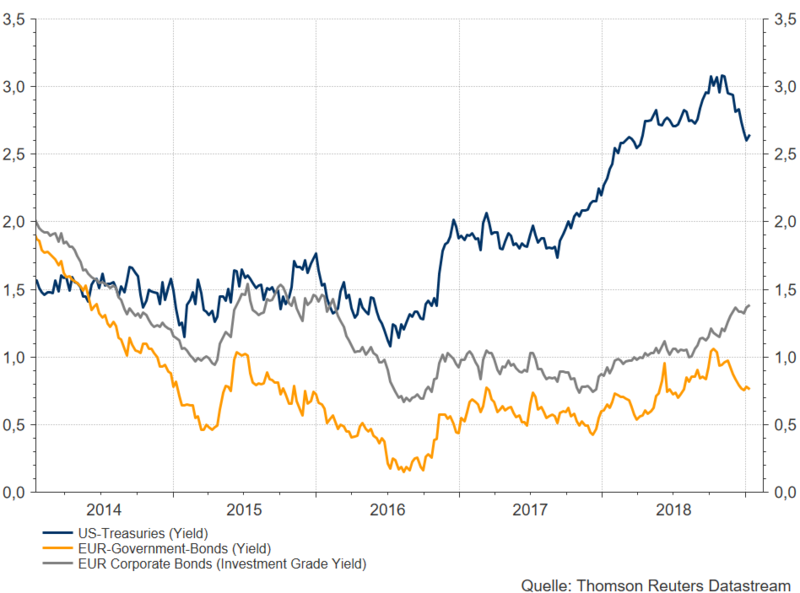 Euro-government-bonds benefited from the latest turmoils in equity markets, Brexit and if compared on a global basis the weaker outlook on economic growth, inflation rates and monetary policy of ECB. The risk of further interest rate hikes in the USA as well as in Europe is relatively low at the moment. The consequence: lower yields in most bond asset classes. Overall, market participants expect global growth to weaken, with very heterogenous growth trends worldwide. Inflation rates should remain low on a global scale, supported by significantly lower energy prices. 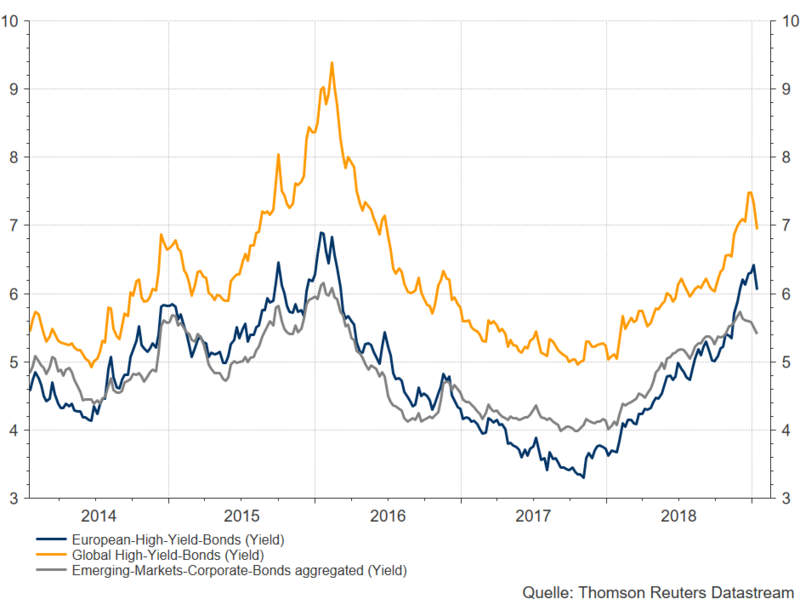 From a Euro-Investor point of view European corporate bonds in the different rating classes seem to be most attractive, as hedging costs for US-Dollar-denominated bonds are relatively high. 1) NB: the fund ratio “yield” equals the average yield of the securities held by a fund prior to costs for forex hedging; please bear in mind that this ratio is not equivalent to the fund performance. For the fund performance (i.e. the development of the value) of the aforementioned funds, please refer to the overview table on page three. The above-cited table does also not account for any fees reducing return such as the management fee or individual account or depositary fees. The development of historic yields is not a reliable indicator for future developments of a specific asset category or asset class. The charts above do not include any fees or costs. Data as of 30 December 2018. The performance is calculated in accordance with the OeKB method. The management fee as well as any performance-related remuneration is already included. The issue premium of up to 3.50 % which might be applicable on purchase and as well as any individual transaction specific costs or ongoing costs that reduce earnings (e.g. account- and deposit fees) have not been taken into account in this presentation. Past performance is not a reliable indicator of the future performance of a fund. Prognoses are no reliable indicator for future performance. Paul Severin has worked at Erste Asset Management since April 2008. Until 2012 he was responsible for the company’s product management; he has directed communications and PR activities since April 2012. From 1992 to 2008, he was director of equity fund management and deputy director for institutional funds at Pioneer Investments Austria in Vienna. His career in the securities business began in 1992 at Constantia Privatbank as a portfolio manager and analyst. He worked as primary analyst at Creditanstalt Investmentbank in Vienna from 1994 to 1999. He studied international business at Innsbruck University and Marquette University in Milwaukee, WI, USA. Before his university studies, he worked at Dornbirner Sparkasse in letters of credit and export financing. Paul Severin is a member of the board at ÖVFA (Austrian Association for Financial Analysis and Asset Management) and a CEFA charter holder.